Conference tournaments are winding down, and you can count the number of days until Selection Monday on one hand. That means it is time for another installment of bracketology. Just like the last bracketology update, Megan will discuss our top 16 teams, and Jacob will break down the bubble. The field was once again primarily determined by the HHS Rating, with some exceptions near the bubble. The ACC conference tournament shook things up at the top, with Louisville falling after losing to Notre Dame by 20 points in the finals. This should send the Cardinals to Albany as the two-seed with UConn. Oregon’s loss in the Pac-12 championship is less harmful. The Ducks played a close game with Stanford, and even with an additional loss still have the next best resume to move up to the top seed line. Ultimately, we were swayed by their elite offense and strength of schedule. Against the top 25 teams by HHS rating, Oregon is 7–2 and Mississippi State is 5–2. 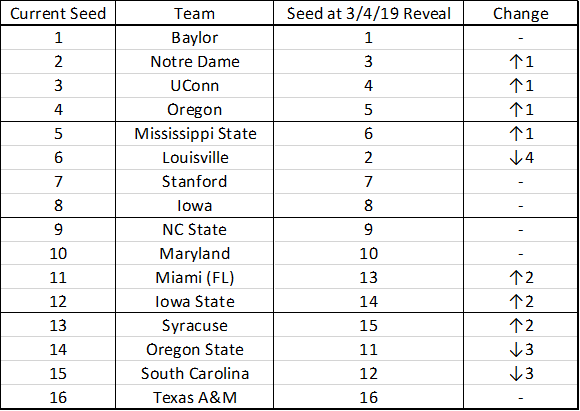 Still, deciphering true seeds 4–6 is challenging with Oregon, Mississippi State, and Louisville all having resumes of similar strength. Even if the committee reorders these seeds, it is clear that Oregon will play in Portland and UConn will travel to Albany. Mississippi State and Louisville will each be heading to one of those arenas with the possibility of facing a tough opponent in the regional final on their near-home turf. On the three and four-seed lines, early losses in the Pac-12 and SEC tournaments hurt Oregon State (lost to Washington) and South Carolina (lost to Arkansas), respectively. Their losses allow Iowa State, who played Baylor closely through three quarters before losing in the Big 12 final, to move up and earn the final three-seed spot. Automatic qualifiers were selected in the same manner as before: the highest ranking team in conferences that have not already finished their conference tournaments will be listed as the conference’s auto-bid. 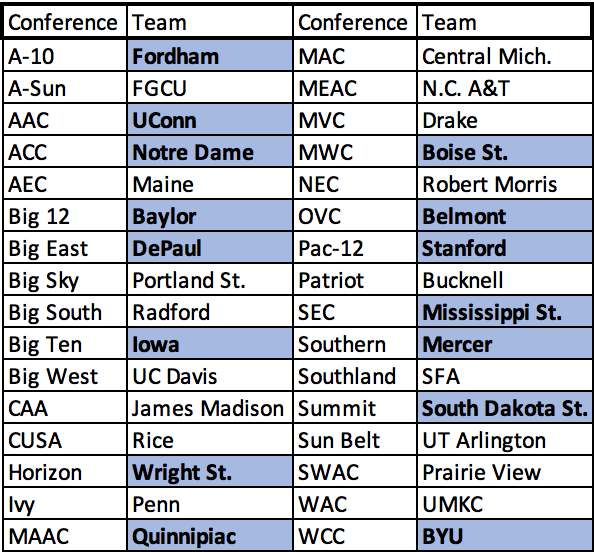 As of March 13, teams that have already won their conference championships are highlighted and bold. Below are two lists. On the right, the bubble according to our automated HHS Rating, and on the left, what we have decided using an integrated approach similar to what the selection committee uses. The HHS Rating says a lot about a team and their ability, but, on its own, it is not a stand-in for tournament resumes. Instead, we have used the HHS Rating as a way to measure the strength of a team’s opponents. Like the team sheets used by the committee, the HHS Comparison Tool uses our HHS Rating to order opponents by strength in order to easily compare tournament resumes. 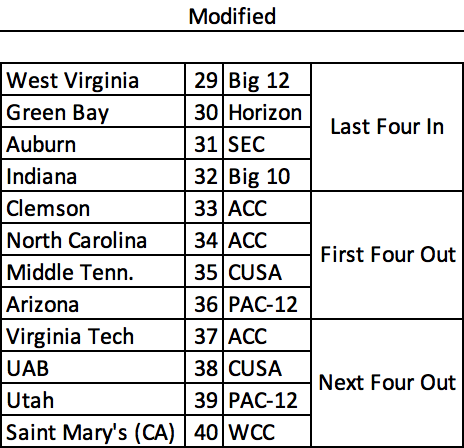 There were some major changes after assessing each team’s tournament resumes. The largest changes were California and UCF. According to the HHS, they fell into the ‘next four out’ category. But once we looked deeper, the two teams jumped all the way to being locks for the tournament. Compared to a team like Clemson, our first team out, it is clear that UCF and Cal have far superior wins. Some teams made much smaller but equally significant jumps. Auburn went from the first team out to the second-to-last team in thanks to recent wins over Missouri and LSU. Also helping their cause were teams like Middle Tennesee, who fell due to multiple losses to teams outside the top 100 like Marshall and Tennessee Tech. 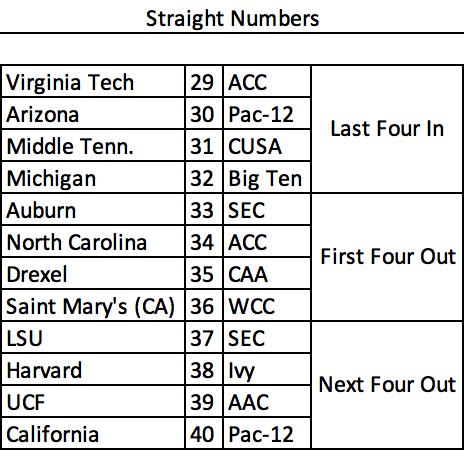 Arizona and Virginia Tech also suffered because of similar losses to mid-majors and lowly conference opponents. Some teams to keep an eye on come Monday are Green Bay and West Virginia. Unlike Charlie Creme at ESPN, we think they deserve a spot in the tournament. West Virginia has the stronger case with wins over Baylor, Texas, and Kansas State, all three are teams that Creme has in his field. 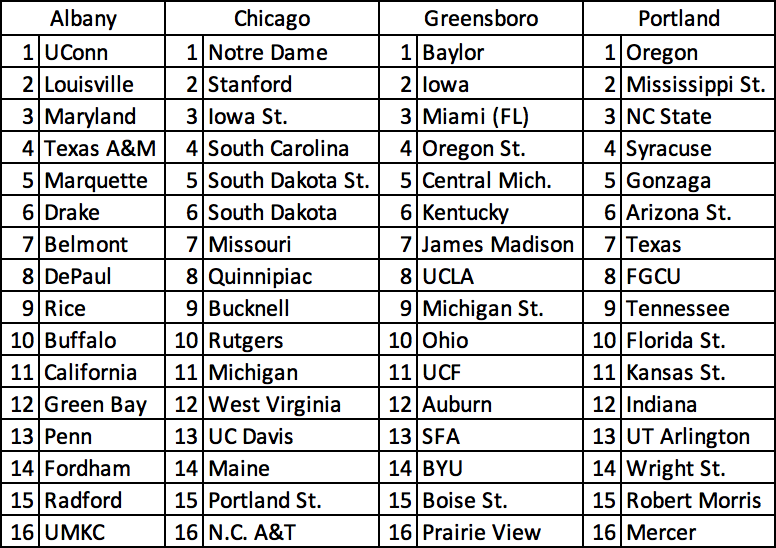 Green Bay has a marquee win over Missouri and a bundle of wins against teams in the 12 to 14 seed range. If you like this content, please support our work at Her Hoop Stats by subscribing for just $20 a year. All stats are from Her Hoop Stats for games through March 13. Thanks to Aaron Barzilai and Allison Chapman.